Bescano is a small town just outside Girona close to Salt and the first town or village out towards the hills to the west of Girona. Originally we were just passing through aiming to explore the hills and cliff outcrops (cingles) in the direction of Angles and Olot, but as we were driving out of Salt we noticed there seemed to be an event on the river - which we later discovered was the World Cup for Free-style Kayaking. Bescano is on the Ruta de Carrilet a long distance bike path created from a disused railway route (the Carrilet was the name of the train) that stretches from Girona to the coast at Sant Feliu. In a westerly direction is follows the Ter out towards Angles and, as we discovered later in the day, is part of a route that follows the Ter through Les Guillieres hills where dams have created the lakes of Sau and Susqueda. To begin with though we just started in and around the town. Bescano, like many places to the west of GIrona is surrounded by wooded hills which are much wetter and deciduous than the drier alzina forests closer to the coast. The presences of lots of water makes walking feel more like English or French countryside with hazards like stinging nettles and brambles which are practically non-existent to the east. We parked in the munipical car park and then followed a track that met up with a mill-stream at the bottom of the hill, then followed the mill-stream around the outskirts of the town to the sports stadium. We then crossed the main road and found ourselves at the back of a very languid river Ter which looked shallow enough for wading/swimming. 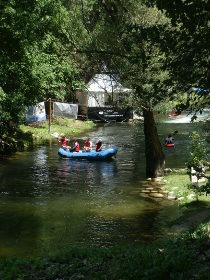 We then followed the river along the path down towards where we had seen the canoeing event. 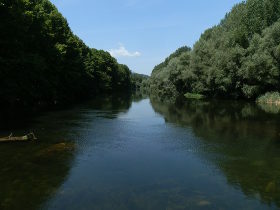 The river itself was broad and slow almost like the Dordogne with a lovely walk through the woods to the side. There is a man made bridge across the river but access is restricted for quarrying. Instead we continued through the woods to the side, before taking a turning up to the Ruta de Carrilet path. This runs next to the river and just below the main road for a while, but with the docile pace of the river it was difficult to imagine what the canoeing would be like. 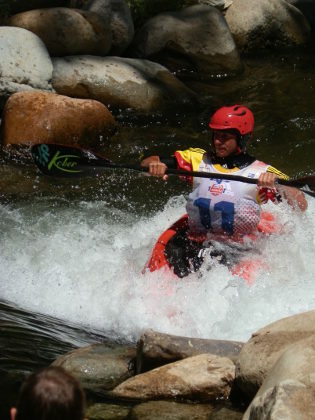 At we were walking on the Ruta de Carrilet there was a steady stream of families coming the other way and then almost just around a corner we came to the main event the free-style kayaking World Cup which was taking place on the river. It really was quite unexpected. Even without the competition, the who canoe area is almost like a mountain stream specially prepared for white water kayaking. The only other place we've seen this type of set up in Catalonia has been in La Seu d'Urgell in the mountains. To find the centre just outside Girona was therefore a real surprise. 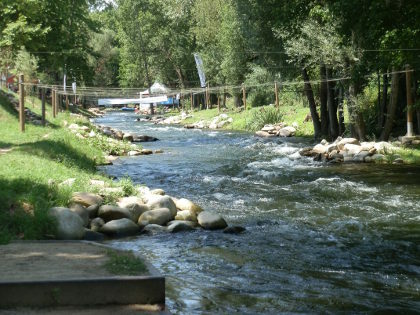 Having watched for a bit (and allowed our dog a good swim in the river) we returned along the Ruta de Carrilet to the town to see the centre and as we were walking we realised that many of the mountain bikers were numbered following a Ruta del Ter biking event. 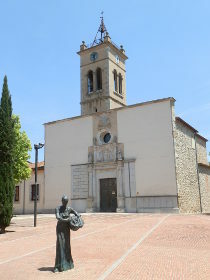 The centre of Bescano is pleasant enough being well maintained, but really is more as a commuter community than perhaps a place to visit on its own. 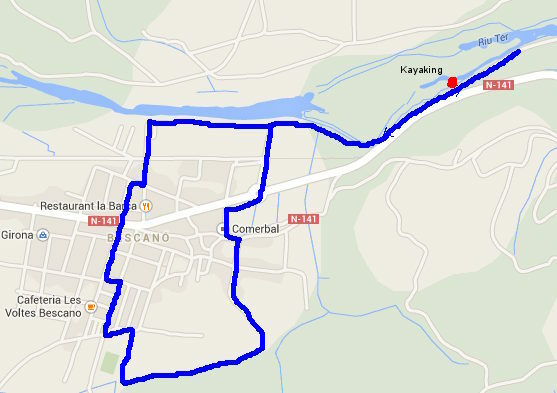 But would make a good stop if you're planning to visit the river and surrounding countryside.